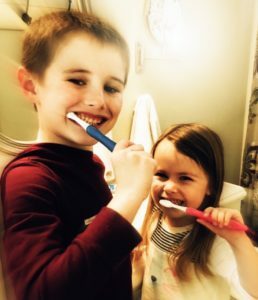 If getting your kids to brush sometimes feels like a losing battle, here are a few tricks and tips that just might help get them excited about brushing. 1. Let them pick their own toothbrush so they feel involved and excited about using it. 2. Give them their own cute toothbrush holder to store their brush in when they’re not using it. 3. Tell them what the toothbrush is doing and why it’s so important to brush. Kids always want to know why, right? Why mom? But why? 4. Brush your teeth together so they see that brushing is important to you too, not just something you tell them to do. Use brushing time to connect with your kids. Time with parents is special for kids, so if you make it something you always do together, they will look forward to it. Establish a routine that works for your family and ensures that brushing gets done twice daily. 5. Let them practice brushing on you. This may sound a little scary, but most kids find it fun and interesting. It allows them a close-up view of all the ridges, grooves and curves of the teeth where plaque (sugar bugs) can hide. 6. Use a fun toothbrush timer or play a 2-minute song while brushing to ensure your kids brush for two minutes in the morning and two minutes before bed. The free Toothsavers game by 2min2x, lets kids learn about the importance of oral care and keep track of when and how long to brush while saving a fairytale kingdom. Sugar Bugs by Sam Weisz is a children’s book that introduces the importance of dental care in a fun and playful way. Make a game out of it. Have a contest to see who can brush their teeth better. Brush right next to them and see how they do. Just make sure they aren’t brushing too hard as this can lead to gum damage. Set a timer for two minutes and see who can brush their teeth the longest. (Proper tooth-brushing needs to be a full two minutes.) If one or both of them give up before the two minute timer goes off, they don’t get a sticker on their tooth-brushing calendar. 8. Create a rewards system. Do something simple that works for your family. It can be a calendar or something as simple as a index card with two spaces for each day where they get a sticker or a stamp each time they brush well. 9. Use a plaque-revealing rinse (disclosing solution or tablets). Most kids love stuff that’s gross, so it’s a good way to attract their interest. This rinse turns the plaque on your child’s teeth colors and allows them to see the areas they are missing with their toothbrush. One example is Listerine’s ‘Agent Cool Blue,’ a pre-brush mouthrinse that kids ages six and older can use to help improve their brushing skills. 10. Always compliment your kids on a job well done. A little praise goes a long way! How can Dr. Holt help you?